A simple legislative majority may not be enough to raise taxes in some states. In this article, the Center on Budget Policy and Priorities’ Samantha Waxman discusses the impact of requiring a legislative supermajority to approve tax increases. Samantha Waxman is a Research Associate at the Center on Budget and Policy Priorities. Florida voters this fall will consider a constitutional amendment requiring a supermajority vote of state lawmakers to approve any revenue increase. As the recent budget struggles in Oklahoma show, these kinds of short-sighted supermajority requirements can hamstring lawmakers and take away the tools that help states invest in roads, schools, health care, public safety, and other foundations of strong communities. While legislatures in most states (34 states plus the District of Columbia) can approve tax bills with a simple majority vote in each house, in 16 states some or all tax bills require a supermajority vote —ranging from 60 percent to 75 percent — of each house. Most of these states impose supermajority requirements only in limited circumstances. But seven require a supermajority vote of each house (plus the governor’s signature) to enact any bill that increases revenue, even by repealing a tax break. States don’t need supermajority requirements to ensure that taxes will remain manageable and that lawmakers will think very carefully before raising taxes. 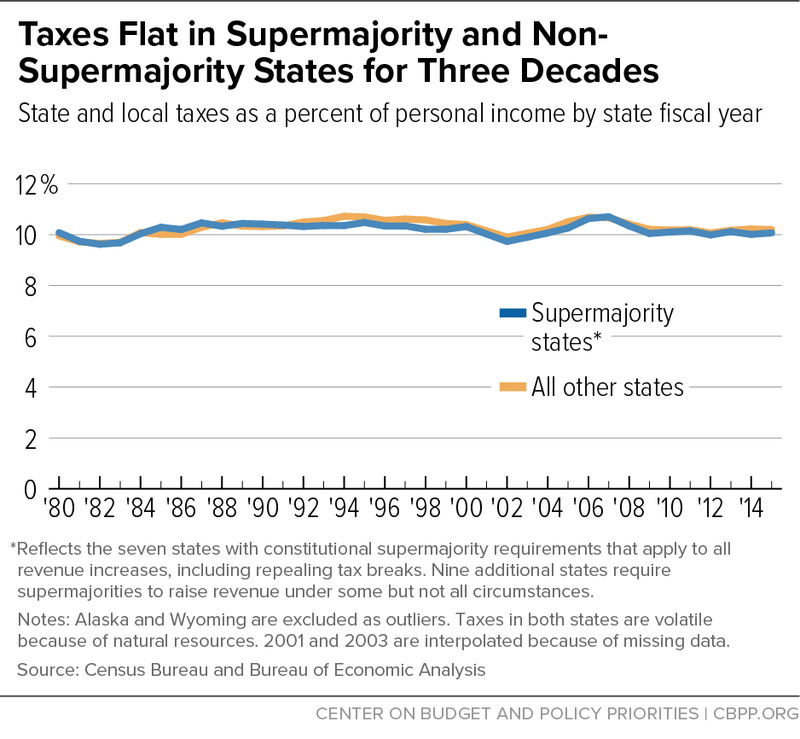 As the graph shows, supermajority states levy taxes at a nearly identical level as other states, on average. That’s in part because states usually enact major tax increases only after recessions, when revenues have fallen well short of the cost of maintaining public services — and generally accompany them with deep spending cuts. Supermajority requirements aren’t just unnecessary. They also harm a state’s ability to properly handle its finances and make critical investments in health care, schools, disaster preparedness, and other priorities. Shift costs from some residents to others by increasing states’ use of fees, which often aren’t subject to the requirements but fall hardest on people who can least afford to pay. Oklahoma, whose constitution requires three-quarters of legislators to approve any tax increase, is just the latest example of the damage that supermajority requirements can cause. Oklahoma has cut support deeply for K-12 education, higher education, Medicaid, and other services over the past ten years; spending of state revenue has fallen by 18 percent since 2009, after adjusting for inflation. This is in part because lawmakers cut taxes in good economic times but then couldn’t raise them after the economy declined. Early this year a bipartisan coalition of business and civic leaders proposed a plan called Step Up Oklahoma, which included a number of long-overdue tax reforms and lowered the supermajority requirement from 75 percent to 60 percent. Despite the track record of supermajority requirements in Oklahoma and elsewhere, some states are still considering adopting them — like Florida, where the ballot proposal would require two-thirds of lawmakers to approve any revenue increases, including setting a new fee or tax or closing a loophole or tax break. In Florida (as in other states), schools, towns, and counties stand to lose big from a supermajority requirement even though it doesn’t apply to measures raising local revenue. That’s because school districts and many counties depend heavily on state financial support. Those dollars are at risk if there is a budget squeeze and lawmakers can’t overcome the strict supermajority requirement to raise new revenue. Rural areas also could be disproportionately harmed, since they rely most on state aid.